Ambrose Atencio Bowl height 6 5/8", diameter 11"
Ambrose Atencio is a Santo Domingo potter who is in his forties. He is a regular exhibitor at Santa Fe's Indian Market and a very prolific potter. We find him to be one of the most compelling potter's from Santo Domingo Pueblo. His work is technically accomplished and his style is�very traditional with evolving aspects specific to his search for mastery. He often paints birds, florals and geometrics. He is known for his thin slips which�permit a translucence at the surface of his pots so that, depending on the light, the red clay foundation is perceived to greater or lesser degree. A photograph of Ambrose and an examples of his work�are shown on page�59 of Dr. Gregory Schaaf's book Southern Pueblo Pottery: 2,000 Artist Biographies. 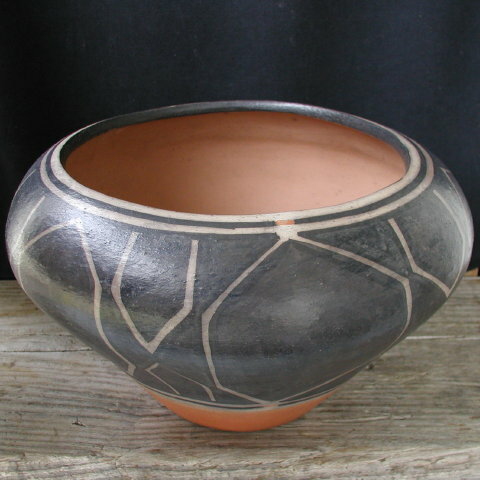 This is a hand-coiled vessel made from clay gathered in a traditional manner at Santo Domingo Pueblo. Signed "Ambrose Atencio" and marked "Kewa" (Santo Domingo Pueblo) and dated 2004. Height: 6 5/8"��������� Diameter: 11"��������� Opening: 7 3/4"
Largest girth: 35"��������� Base: 4 3/8"
*Note on shipping: All pottery shipped to foreign destinations is subject to�additional charge for shipping and insurance to the destination. S & H calculated by the website for pottery purchases�only applies to delivery�in the�U.S. Foreign buyers please inquire about shipping costs for specific pieces before purchasing.